I hosted my linkblog on del.icio.us from the early days, but moved to Pinboard after it’d been sold/bought and changed one too many times. I’d been using IFTTT to mirror the links I saved to Pinboard over to del.icio.us, but noticed today the links stopped months ago. 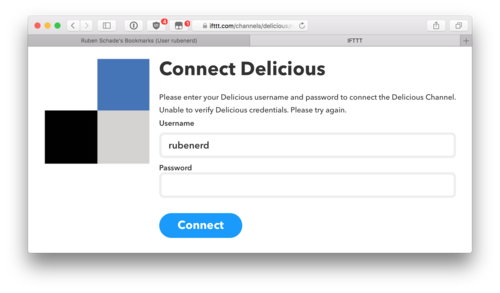 My credentials still work on the del.icio.us site, and IFTTT still lists the account as active, but when I re-connect in IFTTT I get a credential failure. It’s not the end of the world; del.icio.us has had more down than a quilt of late, and I was just using it as a mirror. But it’s yet another step in the once-great service’s gradual demise.